We’ve made it! It’s time for the most exciting game of the year! Last night was a nice little appetizer, but it’s time for National League playoff baseball; tough pitching change decisions, when and who to pinch hit, hey maybe we’ll even see a bunt or two!! I can appreciate what the DH has done for the game, but it takes away most of what baseball strategy is. But I digress, this post isn’t about the DH ruining baseball, it’s about the two most likeable teams in the playoffs facing off for a 1 game matchup of NL Central clubs who play the damn game. Calling this a wildcard game is misleading as the Pirates boast the second best record in baseball going 98-64 all while the Cubs have the third best record at 97-65. This is THE matchup of the postseason. The only downside is that one of these two teams will be sent packing come later tonight. On the mound, two of the best arms in the game with Cy Young front runner Jake Arrieta, and Pittsburgh’s ace Gerrit Cole who is certainly no slouch himself. Jake Arrieta has had a season for the ages going 22-6 with a 1.77 ERA. He’s a career 6-1 with a 1.68 ERA vs the Pirates and threw a 7 inning 1 hit shutout against the home team on September 27th. Look, the guy hasn’t lost a game since July 25th! The last time he gave up more than 1 run was august 15th, and his last non quality start was may 7th. His era of .75 since the all star break is the best of all time, and he is in the Pirates way of winning their second NL Wildcard game in the past 3 years. Oh and the guy on the mound for the Pirates, some guy named Garret Cole, he’s a 19 game winner with a sub 2.8 ERA who throws in the mid to upper 90’s consistently with wipeout offspeed pitching. He came in and struck out the side in the all star game before people had time to realize he was on the mound. If it weren’t for Arrieta, we’d be talking about how dominant Gerrit Cole is and how impossible it is to win a one game series against the pirates would be. Unlike Arrieta, Gerrit Cole has postseason experience. A nice plus is that he’s dominated the Cubs all year. So people looking forward to a slugfest may want to wait until the Blue Jays play the Rangers because runs are going to be tough to come by. The pirates are 1-1 in the past two NL wildcard games as they have had to be the unfortunate son behind the Cardinals, who seem to be a division winning lock each year despite injuries and being in the most competitive division in baseball. They are a likeable group of versatile athletes led by perennial all star and MVP candidate, Andrew McCutcheon. Cutch is one of the best players in baseball. If he played in a larger market he would rival Bryce Harper and Mike Trout in popularity, respect, and admiration. His skillset is one thing that Pittsburgh’s small market draw can’t diminish. Andrew has put together another MVP type season hitting .292 with 23 homeruns, 98 RBI’s, 91 runs, all while being hurt for the first month of the season hindering his production. Finishing in the top 3 in MVP the past three seasons, and winning one, Cutch leads a group of Pirate hitters that bring a strong skill set from top to bottom. The rest of em; Gregory Polanco assumes leadoff duty for the pirates, and while he’s had a disappointing end to the season there is nothing that he can’t do. Polanco, along with Marte and Josh Harrison provide the pirates with a unique skillset that makes this Pittsburgh lineup so difficult to navigate. A notable player missing from tonight’s playoff action is Pittsburgh standout rookie Jung Ho Kang. The rookie second baseman has had an impressive year since coming over to the states before being taken out on a slide by the cubs earlier this month. It will be interesting to see how that changes the game dynamic between the two teams, but definitely not interesting enough to hear the commentators talk about it all night, so let’s all pray there are no double plays or collisions that remind them of it. 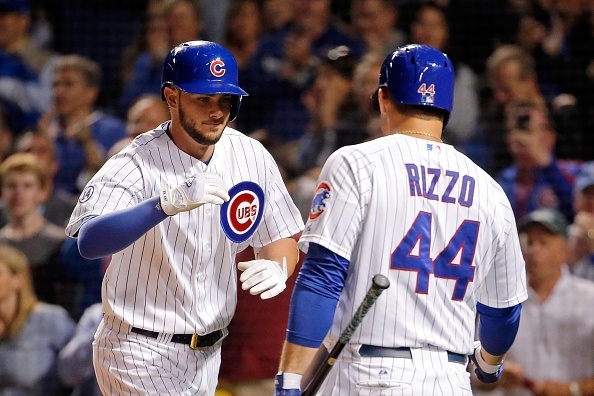 Gerrit Cole will attempt to shut down a young and exciting Cubs lineup that features the NL rookie of the year in Kris Bryant, and MVP candidate Anthony Rizzo. At the age of 26, Anthony Rizzo is the grizzled old veteran of the Cubs. He’s had an impact season at the plate with a batting average of .278 with 31 hr’s, 101 RBI’s, 94 runs, and 17 stolen bases. He does it all, and he does it all while being the leader of this team that has far exceeded expectations. Rizzo is my favorite player. He’s a great player, great teammate, great leader, cancer survivor, infectious smile, the list goes on forever. He means more to his team than any other player in baseball; yes including Bryce Harper, Mike Trout, Kershaw, anybody. He won’t win the trophy, but he is the MVP. Joining Rizzo in the hot Cubs roster are rookies Kris Bryant, Kyle Schwarber, Addison Russel, Jorge Soler and Javy Baez. Likely one of Jorge Soler, Schwarber, or Baez will be left out of the batting order, but are all impact hitters to bring off the bench. Look for manager Joe Maddon to start off the game by playing his better hitters and sacrifice his fielding by starting Schwarber, and Tommy LaStella before making defensive substitutions later in the game. Kris Bryant has been better than touted to be if that’s even possible. After hitting over 50 hr’s in the minors last season, Bryant was tabbed the best hitting prospect in baseball and did not disappoint. In his first season in the show Bryant hit .277 with 26 hr’s, 99 RBI’s, 87 runs, and 13 stolen bases while holding down the positions of third base and left field. His stock is only rising, as he should win multiple MVP trophies moving forward, so we’re ok with not giving him real MVP consideration although he probably should get more. Another player to watch tonight is the redemption of Starlin Castro, a player who lost his position earlier this year due to poor play and lack of effort being shown. While his .265 average is nothing to write home about, Castro has been one of baseball’s best hitters over the past month hitting .367 with 5 hr’s and 21 RBI’s in his past 30 games. His resurgence has given the cubs an added push that makes them dangerous. His clubhouse demeanor has changed, and he has become the player to keep a loose club house in the perfect mood as they make there october push. With Maddon at the helm the Cubs are officially back, but beating the pirates at home will be a tough task. It’s time to see if Arrieta is a special big game type pitcher. With Cole on the mound for the Pirates, Arrieta will need to dominate, and the lineup to produce in the clutch, to ensure the Pirates won’t raise the jolly roger later tonight in Pittsburgh. My Prediction: It’s hard for me to root against the pirates, but I love this Cubs team. Cubs 2-0. Best game of the season, I hope it lasts 45 innings and we have to watch a full series tonight. Either the way, both of these teams are chomping at the bit to play the Cardinals, who everybody should be more than sick of seeing in the postseason. I hope the winner of this game wins the world series.